"The city center is around the hotel"
Hotel Klastrom is warmly welcoming its guests in baroque downtown Győr at Flower Market.The former camelitan cloister has been a hotel since 1987.The square-shaped foundation of the building surrounds a beautiful inner yard.The northern wing,the present carmelitan cloister,bears the baroque Carmelite church with an amazing inner decoration. The former baroque library,as part of the hotel,is suitable for small conferences and seminars. Stepping out of Klastrom Hotel we immediately find ourselves on the pedestrian zone of downtown Győr: most of the touristic sites can be reached by an easy walk, so as the near Rába Quelle Thermal Baths. 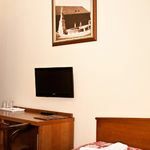 The rating of Hotel Klastrom Győr is 9.3 from the maximum 10, 307 based on actual and valid guest ratings and reviews. 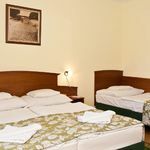 Based on the reviews and comments of actual guests, the services of the Hotel Klastrom Győr have received a high rating of 9.1/10.